Jhlechia Qureshi is the beautiful and inspirational writer and co-founder behind Words and Wraps, a gathering of women of color from different walks of life through words, love, and just a little magic. Their work is geared towards communal reconnection, healing through the essential exchange of words, and the bold reclamation of their story. Words represent a community where women are free to share meaningful elements of themselves with the purpose of inspiring each other mentally and spiritually, releasing stagnated, toxic emotions, and inviting a space for growth. Wraps represents the spirit of their ancestors who guide them in gracefully navigating the challenges of the present. On their crowns they carry the glory of their freedom, the divinity of all women and a foundation of unapologetic self-identity. 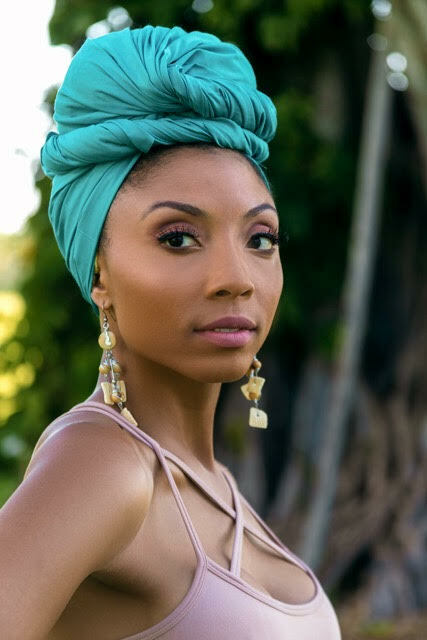 With their new line of headwraps set to debut this year, Jhlechia and her co-founder Saliyma, are well on their way to inspiring a movement of greater love, connection, and self-expression. Jhlechia is truly a beautiful writer, and her words and poetry on motherhood, self-love, purpose, light, and so much more bring a fresh perspective, beauty, and truth to our feeds. I am so inspired by her and what she’s creating and sharing with the world, and it’s been an honor to watch her growth over the last year, and to now be able to share her story with all of you. I'd love it if you'd introduce yourself, what you do, and what you're working on. My name is Jhlechia Qureshi. I’m ½ of the duo behind Words & Wraps. We focus on uplifting women through powerful messaging. Currently, I am working on getting our first line of headwraps up and ready for sale on our website. Outside of Words & Wraps, I am also a writer in the process of putting together my first body of work. Initially, my partner and I began with a desire to create some amazing, intentional events for women in our community, essentially more of what we were wanting to see ourselves. Words and intentions have the power to shape our lives, which is something my partner and I both understood. That understanding initially prompted the birth of New Moon intention setting circles within our South Florida community and has since expanded to include an e-commerce store selling message-driven headwraps. What inspired the work that you're doing? Our inspiration for the work we are doing honestly began with being inspired by the melting pot of cultures within our community. We wanted to find a way to bridge the gap cross-culturally and also just connect with other dope, conscious women. We both have a deeply-rooted love for writing and expression and understand the importance of having a space we feel comfortable to do so in. Trump had just been elected and I remember feeling like, where is our space? How do we create that space where we can really uplift women, specifically women of color who are caught in that terrible (and too often overlooked) intersection of sexism and racism? What is your biggest passion? Do you feel like you're living your passion and purpose? My biggest passion is honestly helping people connect to what truly lights them up. That feeling, that look on someone’s face whose soul is truly aligned with the work they are doing, is honestly indescribable, but I feel like everyone should have a chance to experience it in this lifetime. It’s always been the most beautiful thing to witness that and as such, I’ve really been on a personal journey to make sure I am living a life that feels authentic to me so that in turn I can help others achieve that as well. What is your joy blueprint? What lights you up, brings you joy, and makes you feel the most alive? Within my joy blueprint I would say my family is definitely my main source of joy. I can be having the worst day and get on the floor and play with my 5 year old son and experience life from his perspective and instantly just be on another level vibrationally. Outside of that, I feel like travel is a huge source of refueling and creative inspiration for me, but when I can’t do that, being outdoors really is such an instant mood booster. How do you live intentionally? Are there tools/resources/practices that you rely on to help you stay mindful and grounded? Honestly, this is a practice that I am slowly developing and gaining a better relationship with daily. I have weeks that are better than others, but one thing that is really helping me to be more intentional is actually learning about moon phases and cycles and how we can actually work with the moon’s energy in the way we plan our lives. If the moon can literally have power over the ocean’s movement, why would it not affect us little ol’ humans? Outside of this, I try to write daily. For me, poetry is how I emotionally detox so a lot of times you can look at things I write and see a mirror into what my life experiences are currently like. I can be emotionally guarded sometimes or not always the best at expressing myself, so writing allows me to do that in the most succinct form. What would your younger self think about what you're doing now? My younger self what be really proud of the life I have dreamed up. I didn’t grow up with a ton of self-confidence. I always remember people saying cliche things to me like the “the sky is the limit” and quite honestly just never really believing them for myself. Mindset shifting has been and continues to be a journey for me, but one I fight for daily because I know how powerful the mind is and that it can shape your entire reality. As within, so without. Do you have a go-to mantra or affirmation? My biggest dream is to travel internationally meeting with women of all ages and walks of life, helping them to find and connect to their truth. This summer, Words & Wraps will be launching the first of a series of camps with the intention of helping people to connect to what they are most passionate about and pursue it wholeheartedly. Our plan is to develop into a traveling camp bringing heightened self-awareness to all those we encounter and in turn just really shaping the way people approach their desires. To learn more about Jhlechia and Words and Wraps you can connect with her on Instagram @poeticallyj and @wordsandwraps and you can visit their website www.wordsandwraps.com to shop their newest collection of headwraps.